For the first time ever in the history of New Zealand, we bring you yet another amazing epic singing extravaganza in New Zealand in November 2016. 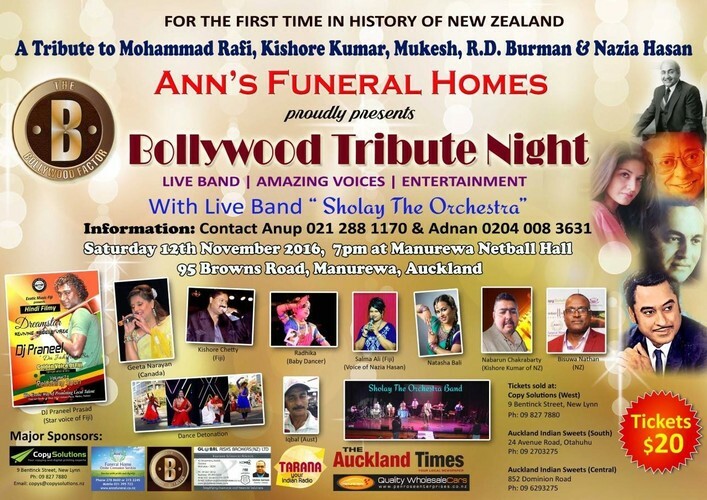 A "Tribute Night" to Bollywood legendary singers, Muhammad Rafi Sahab, Kishore Kumar Da, Mukesh and the Superstar of yesteryear from Pakistan Nazia Hassan along with RD Burman (Pancham Da). VIP Pass: (Front Row Seat Plus Special Meet & Greet with the Singers and Musicians Backstage with Wine and Nibbles and Front Row Seats).